Silver-tone stainless steel case and bracelet. Fixed bezel. 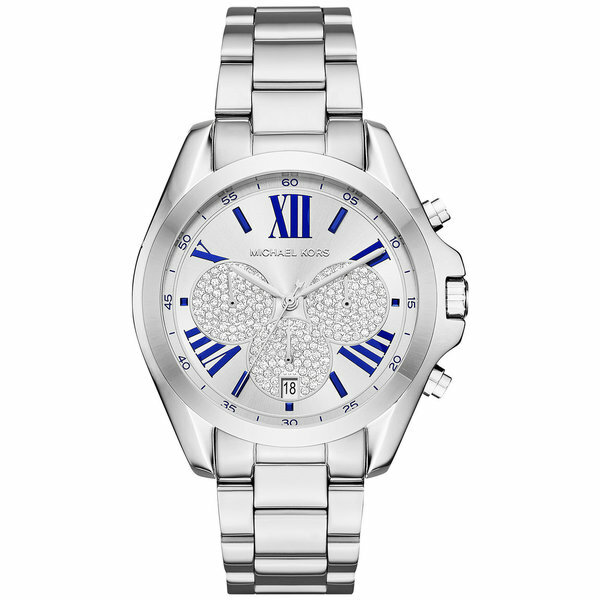 Silver dial with silver-tone hands and alternating blue Roman numeral and index hour markers. Minute markers around outer rim. Date display at 6 o'clock position. Three crystal pave sub-dials. Quartz movement. Mineral crystal. Push/pull crown. Case: diameter 38mm thickness 13mm. Band: width 20mm length 7.5in. Pushbutton clasp. Water resistant up to 50 meters/165 feet. Functions: hour, minute, second, date, chronograph. Michael Kors Women's MK6320 Bradshaw Chrongraph Silver Dial Silver-Tone Stainless Steel Bracelet Watch.All measurements are approximate and may vary slightly from the listed dimensions.Women's watch bands can be sized to fit 6.5-inch to 7.5-inch wrists. Dimensions Case: diameter 38mm thickness 13mm. Band: width 20mm length 7.5in.